What are the benefits of playing "live roulette" at an online casino? This is one of the questions that we receive most frequently on this site - online casinos will advertise their "live roulette" and "live blackjack" offerings quite heavily, and many people are unsure as to what these offerings really are. To start, "live roulette" is when the online casinos will actually get a REAL person to spin a real roulette wheel. So, just as you would see in a brick-and-mortar casino, you will be interacting with a real croupier that is operating a roulette wheel. 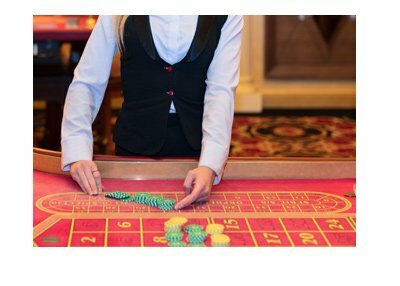 Thanks to technology, online casinos have everything synced up so that computer software will take your bets and automatically pay out the winnings after the roulette wheel comes to a halt. In addition, video cameras will show all of the action in real time, plus you will be able to interact with the croupier. 1) Mimicking the "live casino" experience. If you want to feel like you are playing at a real casino (such as the type that you would find in Las Vegas), the "live roulette" experience is certainly for you. 2) Interacting with the dealer. Dealers will often talk to you as you are playing, and you will be able to type things into the chat that they will be able to read. While this can take a bit longer than traditional online casino games, it adds a great deal of enjoyment to the experience. 3) Learning the game. By interacting with a real croupier, you will be able to learn a bit more as to how roulette works, as they will usually do a good job of explaining what is going on. This will translate into better experiences if you play in a traditional brick-and-mortar casino down the road. I love the online casino experience, though playing "live roulette" at an online casino adds another layer that makes the experience even more enjoyable. Try it out yourself - I doubt that you will be disappointed.